Chhetri said the team should not get carried away with the triumph in the Intercontinental Cup. 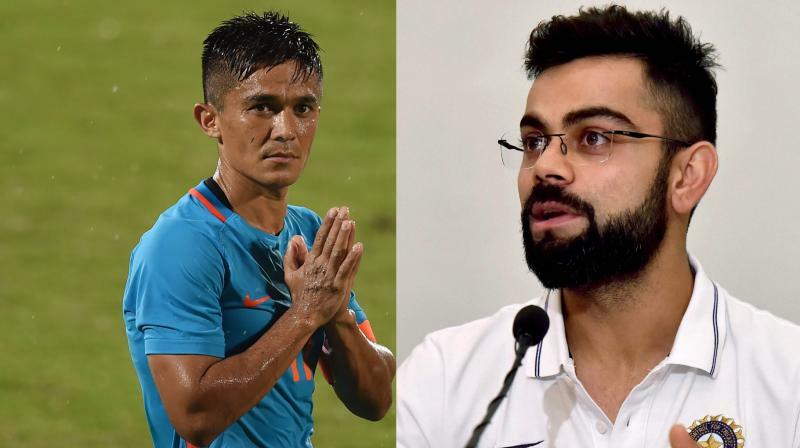 New Delhi: Talismanic national football team captain Sunil Chhetri feels India should play against top-10 ranked sides of the continent in the next few months if the country desires to do well in next year's Asian Cup. Chhetri said it would be difficult to play against the top-five countries -- Australia, Iran, Korea, Japan and Saudi Arabia -- which are playing in the World Cup starting tomorrow in Russia but they can for other teams which are above India. "I definitely feel so (play against top-10 ranked teams in Asia). It will be difficult to play against the top five as they are playing in the World Cup. But we need to play against teams better than us and that also away matches," Chhetri told PTI in an interaction. "At home we are doing better but in away matches, if I may say so, our record is poor," said Chhetri, who is a brand ambassador of online fantasy sports platform StarPick which on Wednesday announced the launch of the football World Cup 2018 platform offering prizes worth Rs 20 crores. Chhetri, who turns 34 in August, said the team should not get carried away with the triumph in the Intercontinental Cup and it should continue to work hard to perform well in Asian Cup. "We don't get to play against New Zealand and Kenya everyday but the teams we are going to play in Asian Cup (in January 2019) like Thailand and Bahrain are two to three levels higher than us. We should be happy with what we have done but not get carried away. We have to improve a lot," he said. "UAE, Thailand and Bahrain (which are in India's group) are miles better than us and we have to put our heads down and keep working hard," said Chhetri, who played his 100th international match during the four-nation tournament in Mumbai. Chhetri struck eight out of the 11 goals India scored in the Intercontinental Cup to become the joint second highest international goal scorer among active players along with Argentine great Lionel Messi. During that tournament, just before his 100th match, Chhetri made an appeal to fans to throng the stadium and watch the Indian football team play, which was an unprecedented act for a national team captain. He said it was not a planned appeal but came out spontaneously after India played in front of an empty stadium in the first match against Chinese Taipei. The appeal via a Twitter video post got support from the likes of Virat Kohli and Sania Mirza. "Had it been planned I would not have been allowed to do that. It was something which did not run through my PR team, it was very random. I had no clue it will have that kind of traction. I really appreciate all the eminent persons coming in and supporting me. It worked as you saw a jam-packed stadium in the next match," Chhetri said. "Usually we enjoy jam-packed stadium in the ISL in Kerala, Bengaluru, Kolkata, Northeast and Chennai but on the first match (against Chinese Taipei) the stadium was empty and it was a bit disappointing and probably that was why I made the video." Asked if he has personal acquaintance with Kohli, he said, "Virat generally loves football. We talk on regular basis, not on twitter though. He likes football and probably that is why he came to my support. He is a part of FC Goa team and comes to watch ISL matches. "He is knowledgeable about football and that is why he wants to encourage fans to watch football matches and that is great. I did not ask him personally though." Meanwhile, StarPick will engage football fans to enable them to use their skills to build and own their teams on the platform and be a part of the excitement associated with the football World Cup in Russia. The top five football fans on the platform will also have the opportunity to travel to United Kingdom and witness the 2018 English Premier League live. Starpick.in was launched in March with the start of IPL XI and has successfully concluded this engagement with users winning prizes up to Rs 10 crores. The platform offers the widest game portfolio from across the world including cricket, kabaddi, European football, hockey, basketball, formula 1, golf, bicycle racing to name a few. Trigam Mukherjee, Co-Founder and CEO of StarPick, said, "It is significant because India is predominantly a cricket crazy country but what we have seen in the last five years is a latent demand for football, and fantasy sports will power non-cricket fans like in football, which will help in growing the fan base of these sports.